'Skinny Repeal' Of Obamacare Might Be A Good First Step, Say GOP Backers : Shots - Health News Republican senators are warming to the idea of a scaled-back plan that would delete the Affordable Care Act's individual and employer mandates but leave much of the law intact. 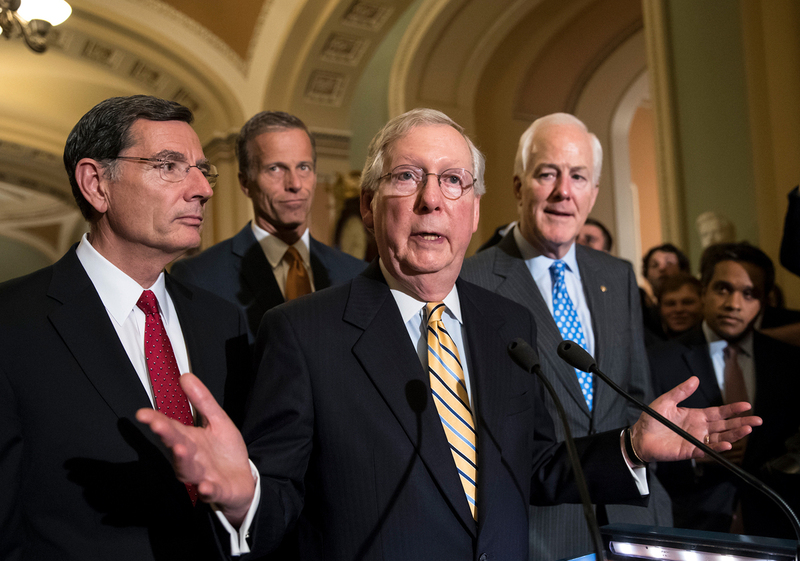 Betting that thin is in — and might be the only way forward — Senate Republicans are eyeing a "skinny repeal" that would roll back an unpopular portion of the federal health law. But health policy analysts warn that the idea has been tried before, and with little success. Senators are reportedly considering a narrow bill that would eliminate the Affordable Care Act's "individual mandate," which assesses a tax on Americans who don't have insurance. The bill would also eliminate the ACA's penalties for some businesses – those that have 50 or more workers and fail to offer their employees health coverage. Details aren't clear, but it appears that — at least initially — much of the rest of the 2010 health law would remain, under this strategy, including the rule that says insurers must cover people who have pre-existing medical problems. In remarks on the Senate floor Wednesday, Sen. Minority Leader Charles Schumer, D-N.Y., said that "we just heard from the nonpartisan Congressional Budget Office that under such a plan ... 16 million Americans would lose their health insurance, and millions more would pay a 20 percent increase in their premiums." The CBO posted its evaluation of the GOP's proposed plan Wednesday evening. "We need an outcome, and if a so-called skinny repeal is the first step, that's a good first step," said Sen. Thom Tillis, R-N.C.
"I think that most people would understand that what you're really voting on is trying to keep the conversation alive," said Sen. Bob Corker, R-Tenn. "It's not the policy itself ... it's about trying to create a bigger discussion about repeal between the House and Senate." But what if, during these strange legislative times, the skinny repeal were to be passed by the Senate and then go on to become law? States' experiences with insurance market reforms and rollbacks highlight the possible trouble spots. By the late 1990s, states such as Washington, Kentucky and Massachusetts felt a backlash when some of the coverage requirement rules they'd previously put on the individual market were lifted. "Things went badly," said Mark Hall, director of the health law and policy program at Wake Forest University. Premiums rose and insurers fled these states, leaving consumers who buy their own coverage (usually because they don't get it through their jobs) with fewer choices and higher prices. That's because — like the Senate plan — the states generally kept popular parts of their laws, including protections for people with pre-existing conditions. At the same time, they didn't include mandates that consumers carry coverage. That goes to a basic concept about any kind insurance: People who don't file claims in any given year subsidize those who do. Also, those healthy people are less likely to sign up, insurers said, and that leaves insurance companies with only the more costly policyholders. Bottom line: Insurers end up "less willing to participate in the market," said Hall. It's not an exact comparison, though, he added, because the current federal health law offers something most states did not: significant subsidies to help some people buy coverage. Those subsidies could blunt the effect of not having a mandate. During the debate that led to passage of the federal ACA, insurers flat-out said the plan would fail without an individual mandate. On Wednesday, the Blue Cross Blue Shield Association weighed in again, saying that if there is no longer a coverage requirement, there should be "strong incentives for people to obtain health insurance and keep it year-round." Even though the mandate's penalty is often criticized as not strong enough, removing it would still affect the individual market. "Insurers would react conservatively and increase rates substantially to cover their risk," said insurance industry consultant Robert Laszewski. That's what happened after Washington state lawmakers rolled back rules in 1995 legislation. Insurers requested significant rate increases, which were then rejected by the state's insurance commissioner. By 1998, the state's largest insurer — Premera Blue Cross — said it was losing so much money that it would stop selling new individual policies, "precipitating a sense of crisis," according to a study published in 2000 in the Journal of Health Politics, Policy and Law. "When one pulled out, the others followed," said current Washington Insurance Commissioner Mike Kreidler, who was then a regional director in the federal department of Health and Human Services. The state's individual market was volatile and difficult for years after. Insurers did come back, but won a concession: For a time, the insurance commissioner lost the power to reject rate increases. Kreidler, first elected in 2000, reclaimed that authority. "Few markets can go bad on you as fast as a health insurance market," said Kreidler. That's because the requirement under the ACA meant that some smaller firms didn't hire people or give workers more than 30 hours a week — the minimum needed under the ACA to be considered a full-time worker who qualified for health insurance. "The real impact would come if feds stopped promoting enrollment and did other things to make the exchanges [— the state and federal markets through which insurance is offered —] work more poorly."